Summer is for veggies. Yummy, fresh, crunchy, sweet, sweet veggies. 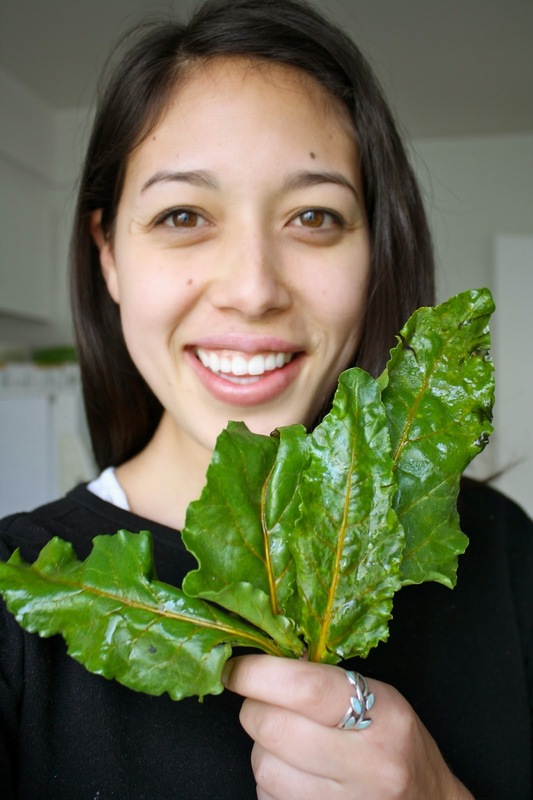 Which is why it's so important to seize the opportunity to try what's in season and be adventurous with your cooking. With that spirit in mind, we paroozed the farm mar in search of good deals and saw a bundle of fresh green tomatillos. They were a few bucks for about a dozen so we said to ourselves, "I'm sure we can do something with these!" and popped them in the bag. A few days later I opened the fridge and saw that green bundle looking at me. I decided something had to be created with them and Chris suggested it be salsa! 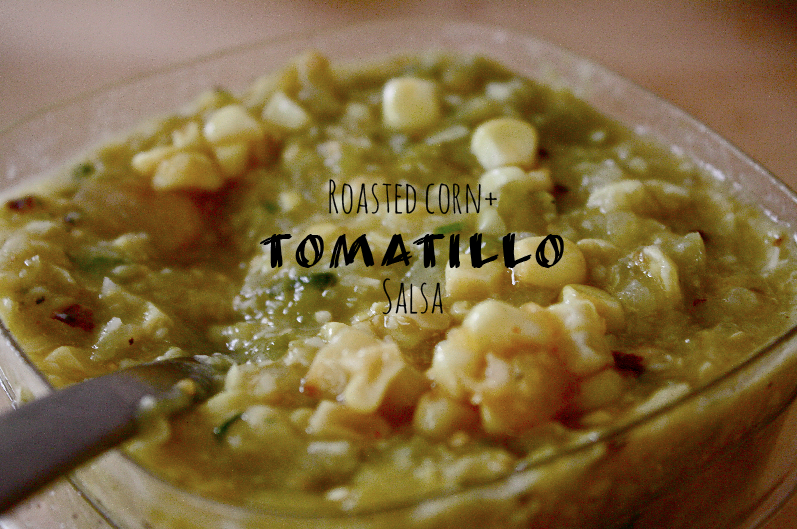 So I soaked the tomatillos in a bowl, watched the corn husks soften, and prepped the other veggies for roasting. What we ended up making was so refreshing, satisfying, and honestly so simple and fast to make. It lasted us over a week in the fridge and we were able to top our taco dinner, egg breakfast, and stewed pinto beans. I just loved seeing the veggies roast and color under the broiler and it inspired me to want to try creating other sauces in the future. Turn on broiler. 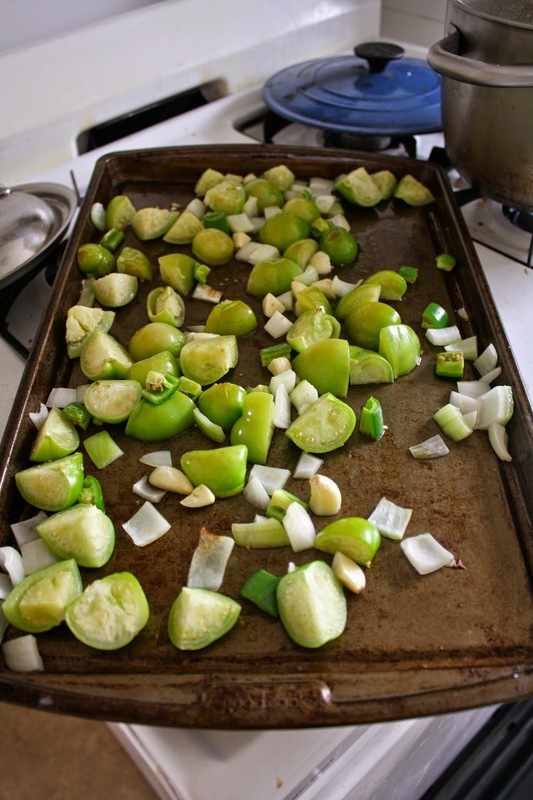 Prep fresh tomatillos by soaking them husks on in a bowl of water to ease removing the outer layer for a few minutes. 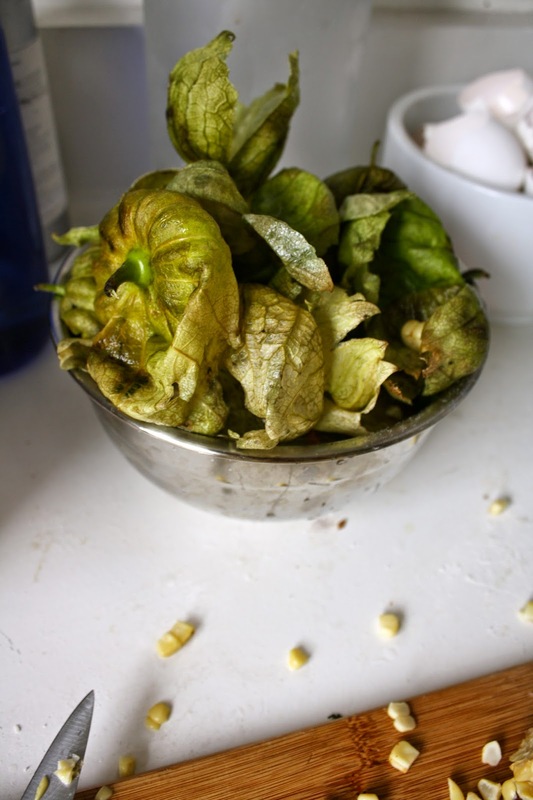 Remove tomatillo from husk by peeling them away or squeezing the bottom of the husk so the tomatillo slips out. They should come out clean but almost oily feeling and be sure to place them back in the bowl of water to rinse them off. Chop into quarters along with the onion and garlic and place on baking sheet. Add salt, pepper, and chili powder to the veggies and pour a glug of olive oil around, tossing to lightly coat. Place in broiler for 5 minutes, remove and stir, then place back in for another 5. Chop kernels off of corn and add to veggies on the baking sheet and finish in the oven for another 5 minutes. 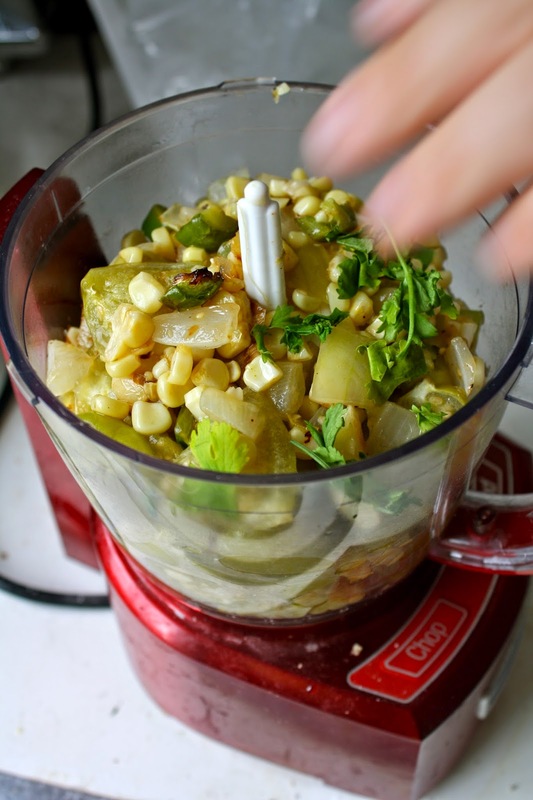 Remove once onions are softened and corn and tomatillos appear to be getting golden and add to food processor. Add the juice of one lemon and the cilantro and pulse quickly until just combined. If you want a smooth texture, blend all the way through, or to leave it a bit more rustic and chunky, just pulse on and off until desired texture is reached. Remove and serve warm with tacos, enchiladas, or burritos. Or chill to serve as a salsa with chips.